The 1st Occupational Safety Day took place at the Mannheim plant on 14 February 2019. Interested employees were able to inform themselves about safety at work, at the wheel or in their free time. 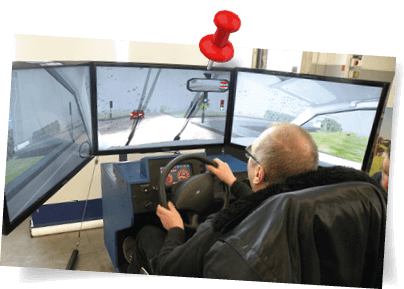 In a driving simulator, the employees could simulate critical or risky situations in various programmes such as driving in the city, under the influence of alcohol, driving in the dark or in the rain. In several modules of the so-called Stumbling Course, different situations in everyday operational routine were demonstrated which can lead to stumbling, slipping and falling accidents. Stairs, defective handrails, objects left lying around and unsuitable floor coverings are some examples. Stress was another important topic. The employees were given the opportunity to test their stress behaviour and their personal reaction strategy. The Occupational Safety Day was very well received by everyone; therefore, we plan to organise more events around the same topic. Safety is of utmost importance to us. For this reason, we have a safety officer who permanently takes care of occupational safety matters and is in constant contact with our employees.